It appears as though Tom Brady has been lurking in the bushes all along. Well, not really. But he is following the New England Patriots. It makes sense: he’s the greatest quarterback in team history. Not backing that up with facts either. Argue it. Bam. You can’t. Boom. But Brady knows how lousy this QB situation is. He should be out there. The commish came after him after all this stuff was over. It’s really stupid and now Jimmy G may or may not be hurt. Regardless, TB12 is confident his minions will hold it down while he’s out training in the Himalayas or something. Jacoby as in Jacoby Brissett. The guy who played QB in the second half against the Dolphins. TB12 thinks he’s good. Sure, he might not know the playbook the way Jimmy G does and he might not be able to throw like the other two, but he’s not a bad quarterback. Tom Brady said so. 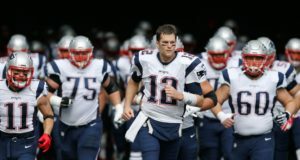 Brady even expressed confidence in his buddy Julian Edelman — if the Pats need him to play a little QB. This calls for one of my world-famous YouTube clips. Batting 1.000? That’s like Sandy Leon-esque right there.